Ulefone Power 5 VS Leagoo Power 5: Specs Comparison. Chinese OEM companies Ulefone and Leagoo surprised most people during the Mobile World Congress 2018. They both released a mid-range smartphone with unbelievable battery capacity. And just like their names, there is truly power inside these smartphones. The Ulefone Power 5 and Leagoo Power 5 are ideal for users who don’t have access to steady power supply. Especially in many African countries. But aside the battery capacity, what other features do these smartphones have. And are they in anyway similar in design or display. With the name identical, which is “Power 5”. Let’s see which one powers the other to a win. Both the Ulefone Power 5 and Leagoo Power 5 are built to be rugged. With the Leagoo Power 5 having the better design. The Leagoo Power 5 comes in a plastic metallic unibody. While the Ulefone Power 5 is in an hexagon-like shape and is made up of metal and leather body. Maybe due to their huge battery, both smartphones are very thick. The Leagoo Power 5 measures 11.8mm in thickness. While the Ulefone Power 5 measures an astonishing 15.8mm in thickness. The Ulefone Power 5 keeps it simple in color variants, available in just Black and Gold colors. While Leagoo Power 5 also offers Black and Gold colors, in addition to Blue color. While the fingerprint sensor of the Leagoo Power 5 is at the back. The fingerprint sensor of the Ulefone Power 5 is moved to the side. Maybe that’s one of the reasons, the phone measures 15.8mm thick. The dual rear camera and dual-LED flash sit at the top-middle. The LED flash is in between the two rear cameras. While the LED flash of the Ulefone Power 5 is at the left side of the rear camera. The two smartphones are bezel-less to an extent. The Ulefone Power 5 features a 6 inch FHD+ IPS LCD capacitive touchscreen. While the Leagoo Power 5 features a 5.99 inch IPS LCD capacitive touchscreen. There isn’t much difference in display between these two phones. They both have a display resolution of 1080 x 2160 pixels. The Ulefone Power 5 has a 402 ppi density. While the Leagoo Power 5 features a 403 ppi density. The display resolution is pretty impressive from both phones. The Leagoo Power 5 captures images with its dual rear camera which have a 13MP and 5MP resolution and f/2.0 aperture on each sensor. Alongside a dual-LED dual-tone flash. A 13MP resolution with f/2.0 aperture is featured in the front camera. While the Ulefone Power 5 comes out much better in numbers. The dual rear camera of Ulefone Power 5 has a resolution of 21MP and 5MP with f/2.0 aperture on each sensor. To enjoy better selfies pictures, the smartphone uses a dual front camera. Which have a resolution of 8MP and 5MP. Under the hood of Ulefone Power, 5 is the MediaTek Helio P23 chipset. With an 8-cores (Octa-core) processor which clocks at a speed of 1.5GHz. The same hardware of MediaTek Helio P23 with Octa-core 1.5GHz processor also powers the Leagoo Power 5. Both the Ulefone Power 5 and Leagoo Power 5 runs on Android 8.1 Oreo. Now to the primary focus of both devices. Powering the Leagoo Power 5 is a non-removable Li-Po 7,000 mAh battery. And also features Qi wireless charging and fast battery charging technology. The Ulefone Power 5 is also with Qi wireless charging and fast battery charging. And it’s powered by a non-removable Li-Po 13,000 mAh battery. 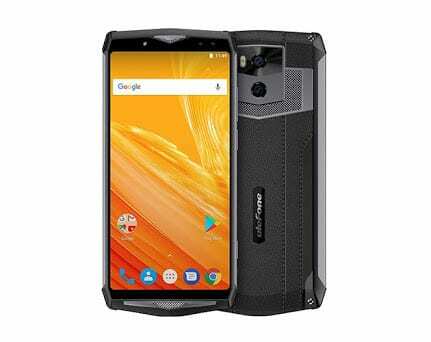 The Ulefone Power 5 is available for about $299 (N104,650). While the Leagoo Power 5 goes for around $286 (N100,100). Both phones have really similar specifications, with Ulefone Power 5 packing a more hefty battery capacity.